The 35 meter Phinisi Liveaboard, a Myanmar Liveaboard, is the newest addition to The Junk family. She is a 140-ton three-mast phinisi taking 18 guests on board in seven cabins. This Myanmar Liveaboard offers seven and 10-night Mergui Archipelago itineraries. The Phinisi Liveaboard also dives Thailand’s Similans, Koh Bon, Koh Tachai and Richelieu Rock with trip lengths of four-nights or six-nights. She’s a classic Southeast Asian slice of history. The Phinisi carries plenty of fresh water and fuel to enable her to easily conduct week-long Thailand and Myanmar liveaboard scuba diving itineraries. 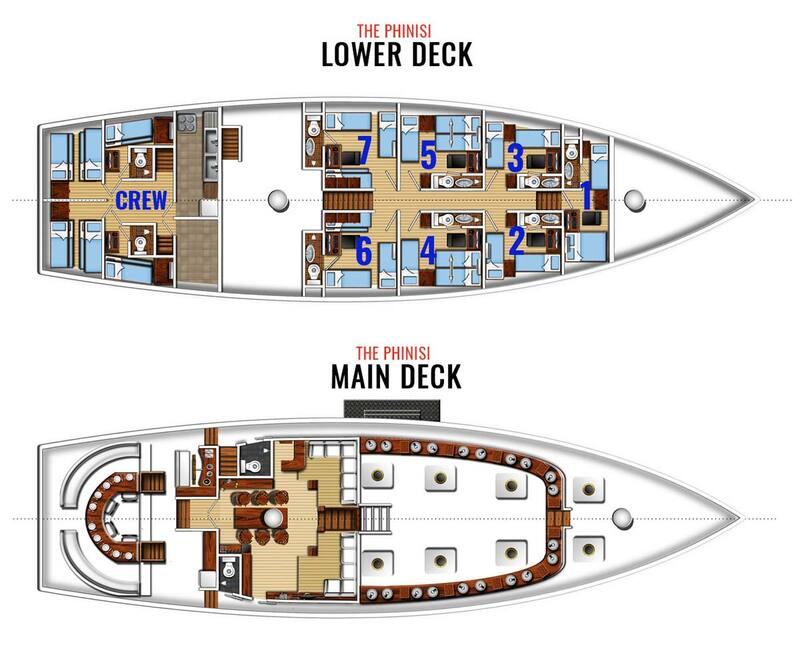 The Phinisi Myanmar Liveaboard features seven cabins from stem to stern. She offers one double bed and a twin bed cabin, two fixed twin-bed cabins, two convertible double or twin bed cabins with three beds and two quad twin bed cabins. All of her cabins are fully air-conditioned and have their own hot water shower and en-suite bathroom. She is available for individual bookings as well as charter cruises. Individual prices are listed below in the schedules. Please contact us for charter prices. All departures are from Phuket, Thailand, serviced by Phuket International Airport. The vessel departs from either Chalong Bay in Phuket, or Thap Lamu, the port just north of Phuket. Transfers are free to and from your hotel or the airport to the boat on departure day. Custom-built for diving in 2007 in Indonesia, “The Phinisi” (pronounced pinisi)–which is a local boat type unique to Indonesia–has a interesting history. When she was launched, she was given the name ‘Sampai Jumpa Lagi’, which means ‘See you again’ in Bahasa Indonesia. She started her career operating dive liveaboard cruises to the Similan Islands and the Mergui Archipelago in Myanmar from 2007 to 2009. The yacht was then renamed ‘S/Y Siren’: the first ever yacht to bear the name of what has over time become the famous Siren Fleet. She diverted to offer dive cruises in other wonderful destinations such as Komodo and the Andaman Islands finally relocating to the Maldives until 2014. After leaving the Maldives and returning to Phuket, she was renamed yet again and became ‘Cheng I Sao’. Cheng I Sao was a legendary fearless female Chinese pirate roaming the Andaman Sea. Cheng I Sao took her guests to the best snorkeling sites on daily cruises, serving lunch and/or sunset dinners. As she has been missing her scuba diving guests, she was reconverted to a liveaboard and named The Phinisi in par with her sister ship, The Junk! Please note: Approximately 26 dives. Itineraries are for general information only. We make no claims to being 100% accurate as there are too many factors affecting the schedule. We will give you the best diving on the best spots we can each day. Please note: Approximately 38 dives. Itineraries are for general information only. We make no claims to being 100% accurate as there are too many factors affecting the schedule. We will give you the best diving on the best spots we can each day.